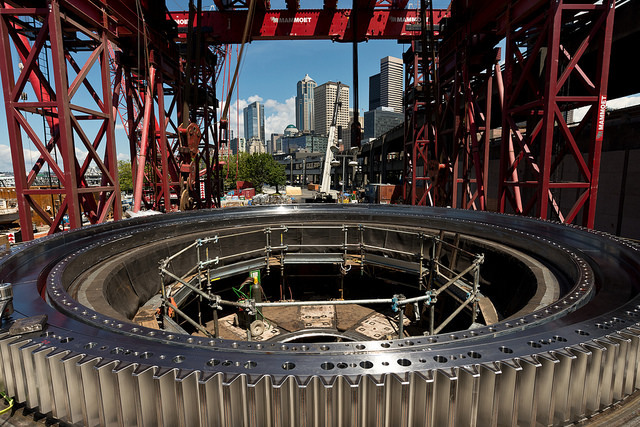 This week, Seattle Tunnel Partners – the Dragados-led design-build consortium constructing Washington State Department of Transportation’s (WSDOT) US$1.35bn Alaskan Way Viaduct Replacement (State Route 99) Tunnel – began installing a new main bearing on its 57ft (17.5m) Hitachi Zosen EPB tunneling machine. Installation of the new bearing comes on the heels of an updated schedule that outlines the path for the completion of the tunnel project. The SR 99 tunnel is now scheduled to open to drivers in spring 2018, according to a revised schedule STP has submitted to WSDOT. Machine repairs are scheduled to wrap up this fall. STP and manufacturer Hitachi Zosen will then perform an extended series of tests to ensure the machine is ready to complete the tunnel drive. Tunneling is slated to resume in late November, with the machine emerging at the north end of downtown approximately one year later. Since lifting the front end of the machine from the ground in March, STP has fully assessed the disassembled machine parts and made significant repairs and enhancements. In addition to beginning installation of the main bearing, STP crews have installed portions of the new seal system that will protect the bearing. Modifications include the addition of reinforcing steel, new monitoring systems and upgrades to the soil-conditioning system to prevent clogging. STP and Hitachi are responsible for the repair effort, including the schedule. While the machine has been under repair, STP has continued work at the future tunnel portals, including construction of ramp and highway connections, and the buildings that will house tunnel operations. STP crews halted tunneling in December 2013 after the machine overheated. Following an investigation, they discovered damage to the seal system and determined it needed to be replaced along with the main bearing. The cause of the damage has not been determined. Responsibility for costs associated with the delay will be determined through the process outlined in the tunnel contract.